Apparently there are more tree lovers out there in CDA than I gave credit to. I just checked with the City of Coeur d'Alene and they say they have found homes for all of the surplus street trees they were offering to the public. The trees were being offered to residents of seven new subdivisions; Sunshine Meadows, The Landings at Waterford, Ramsey Meadows, Bentwood, Echo Glen, Copper Ridge, and Jae's Place. Funding for the trees came from a street tree fee collected on residential building permits. The residential street tree fees can be refunded to builders or new homeowners who plant a street tree upon completion of a new home. Six months after the completion of a home, unclaimed funds are forfeited to the city. The city used those forfeited funds to purchase and plant trees in the same neighborhoods where the fees originated. The residents had to apply for the trees and agree to maintain them. Thanks to citizen Paul Kropp for bringing to our attention an Op-Ed piece by Judith Rodin reprinted in today's Spokesman-Review. The article calls for charting a new course by rebuilding America's overburdened and, in many cases, obsolete, transportation infrastructure. Here's the article, which suggests several reasons why policies need to be changed, including safety, preserving the environment, preserving the economy, and preserving the American Dream. Want to scare yourself? Here's a Wall Street Journal article about world oil supplies that should do the trick. - Just a few years ago, the “Peak Oil” concept was dismissed by the oil industry as a wing-nut theory, but there are a growing number of people in the industry who are embracing the theory now. - The US Energy Department is doing their own study of world oil supply. The article says they should be done this summer. I'm curious to see if their study will corroborate what this article says. So what's your opinion? Is this a scare tactic on the part of the International Energy Agency or do you believe it's true, Future crude supplies could be far tighter than previously thought? Or, is the truth somewhere in the middle? Statewide Emphasis Patrol Hands Out 1,346 Speeding Tickets! Idaho Transportation Department has announced that a statewide emphasis patrol over the week of St. Patrick's Day of this year netted 265 DUI arrests and 43 underage alcohol arrests. The campaign also led to arrests of a lot of other people. Here are the numbers. The Memorial Day weekend each year is the official kickoff to the season. That's right, it's construction season again. But you can minimize the pain of delays and detours by knowing where construction is happening. Holy cow, some people have a lot more time on their hands than I do apparently! Hundreds of people lined up for hours yesterday at the Kootenai County Fairgrounds starting at the crack of dawn, to get $40 worth of free gas in a Verizon/Yellow Pages promotion. Would you wait in line for over two hours for $40 worth of gas? Fewer Americans than last year are expected to travel this Memorial Day weekend, according to AAA. With record high gasoline prices and the slowing economy, AAA expects 360,000 fewer travelers this year. Here's the details from the Coeur d'Alene Press. Here's the Coeur d'Alene Press' article on the US95 meeting yesterday. If you missed the meeting, here's a link to the materials that were distributed, as well as how you can voice your opinion on how US95 can be improved. Interesting enough, the Washington State Patrol called me today, in a follow up to a thread we posted on this blog last week, and asked me to do an update. Last Wednesday, I reported how I was contacted by the WSP, on my personal cell phone, just minutes after taking a picture of the weigh station out near Stateline. In my original thread, I blogged about how I found it kind of scary that they could get my cell phone number that fast, but on the other hand, that it was kind of reassuring to know that someone is watching our transportation facilities. And that was it. I never said I was beat down by the po-po, or harassed, or anything further. The initial trooper who contacted me was very polite and after I explained that I was taking the photo for a power point presentation of projects scheduled for the next 20 years (the weigh station is scheduled to be moved within the next couple years), he was very cordial and simply asked me to alert him ahead of time the next time I need to take pictures of WSP property. That thread was picked up by the national blog ‘Boing Boing’ then by others in turn, including one in Germany and several blogs devoted to photography, and in some cases, blown out of proportion. So today my phone rings and it’s Bob Caulkins from the WSP out of Olympia. He asked me clear up how they got my phone number so quickly because he’s getting calls from the Spokesman-Review asking the same thing. The Spokesman even posted a thread on their own blog yesterday explaining what happened. So here goes: apparently, anytime you get in a traffic accident, get a ticket of any kind, or contact law enforcement for any other reason, they ask your personal information. The info you provide is put into a database that ALL the law enforcement agencies can access. So, they see me take pictures, they pull up my license number, and wa-la, there’s my phone number. Mr. Caulkins said that they do have the ability to get your cell phone number from your provider if they need to, without a warrant, but they can’t do it as quickly as getting it out of their own database. So in addition to that explanation, I would like to emphasize that all interaction I have had with the WSP to date has been very pleasant and cordial, including when I received the speeding ticket that landed my number in their data base in the first place. So thanks for the call Mr. Caulkins, and here’s my tribute to you, all in fun of course. I’ll leave you with this classic from John Cougar Mellencamp where he combines two of my favorite songs. Today. 3-5 p.m. Silver Lake Motel, 6160 N. Sunshine St. Coeur d’Alene. Come tell us your ideas for making US95 flow more freely and ways to improve safety along the corridor. Idaho State Police have closed off-ramps at Cataldo because water is over the roadway. However, the flooding is not affecting travel on Interstate 90. The off-ramps are expected to be closed for some time, according to a dispatcher. The Coeur d’Alene River level was at almost 2146 feet of elevation late Monday, about three feet above flood stage. 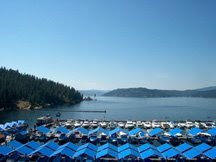 Additionally, Lake Coeur d’Alene is currently just over 2132 feet of elevation. Flooding occurs on the lake at 2133 feet while normal summer level is at 2128 feet, according to Kootenai County sheriff's spokesman Capt. Ben Wolfinger. The Coeur d’Alene River is expected to remain above flood stage for the next several days. Coeur d’Alene Lake is expected at this time to crest at 2135.55 feet late Saturday. Both papers editorialized on the need to improve mobility along the US95 corridor on Sunday. Remember there is a public meeting on this subject Tuesday the 20th from 3-5 p.m. at the Silver Lake Hotel and Convention Center. You can read the Spokesman Review editorial here. You can read the Cd'A Press editorial here. Kootenai County considering impact fees is just another rip-off from overtaxed citizens. The county claims it needs another $2,000 to $5,000 in fees on top of the astronomical fees they already charge. Consider this: A developer buys prairie land which is being taxed at about $10 per acre. He puts in all of the infrastructure, roads, sewers, power, phones, paving, etc. The county and cities pay absolutely nothing for this increased value. The developer now sells some of these now highly valued lots to a builder who pays permit fees, sewer hookup fees, fire district fees, road district fees, water hookup fees, electrical permits, and the list goes on. After this, what is the assessed value with four houses per acre? Maybe $600,000 to $1.2 million per acre or more. Every year the taxing districts receive $4,800 to $10,000 per acre from ground they used to receive just pennies from. And it didn't cost them one red cent. So Rick and Todd and the rest of the bureaucrats across the county need more money to waste on SUVs with fancy paint jobs, $1.2 million fire stations and most of all more government employees. Are our leaders out of touch with reality? You bet! What's your opinion, do you agree with Mr. Gossett? If so, or not, what's your reasoning? Wow, we're busy around here! Here's what you have to look forward to this week: seatbelt checks on both sides of the border, the kickoff of the US95 Study, motorcylce awareness month, and a break from construction for the holiday weekend. Here's the roundup for the week of May 19 from the Spokesman's 'Getting There' column. BTW, a Spokane man was also featured on Good Morning America today for biking to work as opposed to driving to save money on gas. I bet if you add up the time it takes to read the comments and watch the video, it would come out pretty close to 15 minutes of fame. That's our Andy Warhol moment for today. If you haven't already heard, KMPO is joining with the Coeur d'Alene Chamber of Commerce to do a study of low-cost alternatives for improving mobility on US95, and we want your opinion. Development along the US95 corridor has led to higher traffic volumes. As traffic increased, so have intersection safety and congestion concerns. During peak hours, there are long lines of cars waiting at signals along the highway, as well as backups on local cross streets. The highway has been the subject of several previous long-range studies, but with so many projects vying so little funding, it's unlikely money will be available to make significant capacity improvements anytime soon. Inexpensive fixes are needed in the short term to improve safety and keep traffic flowing. A kickoff meeting for the study will be held next Tuesday, May 20 from 3-5 p.m. at the Silver Lake Motel, 6160 N. Sunshine St. in Coeur d’Alene. We hope to see you there, or you can express your opinion right here. While enthusiasts have been doing it forever, the recent spike in gas prices has more and more people resorting to pedal power. Obviously, the impacts on the pocketbook are positive, but there are ancillary benefits to be had too. The Cd"A Press published a pretty good story on the subject here. Question: Do you live close enough to work to make bike commuting a viable option? Well here's a new one. The City of Coeur d'Alene is asking citizens to help them catch non-working streetlights. I've heard of reporting potholes, aggressive drivers, red light runners, etc. but never a non-working streetlight. I applaud the effort though. Here's the details. Mark your calendars if you drive US95 through Coeur d'Alene and Hayden, KMPO is joining the Coeur d'Alene Chamber of Commerce to conduct a US95 Access Study, and we're kicking it off with a meeting next week of business owners along the US95 corridor and members of the public. Development along the corridor has led to high traffic volumes. During peak hours, motorists experience long lines of cars waiting at signals along the highway, as well as on the cross streets. A meeting to promote community understanding of the purpose and scope of the study will be held Tuesday, May 20 from 3-5 p.m. at the Silver Lake Motel, 6160 N. Sunshine St. in Coeur d’Alene. The meeting agenda includes an overview of the study, preliminary alternatives to be studied, and stakeholder and public comments and concerns. 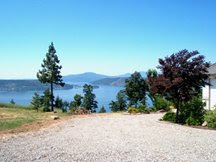 For questions, call KMPO at 1-800-698-1927 or the Coeur d’Alene Chamber at (208) 415-0109, or go to www.kmpo.net. The countdown is on; if you haven't ridden your bike to work yet this week you've still got three more days. And if you don't do it Wednesday or Thursday, Friday is the big 'Ride Your Bike To Work' Day. If you do ride your bike to work in Coeur d'Alene that day, you'll be rewarded. The day starts with a rally ride departing from Riverstone Park at 8a.m. and you've got something to look forrward to during the workday, because there's a post bike-to-work day celebration at the Coeur d'Alene Brewing Company that night from 5-7 p.m. Keep in mind though that you can still get a DUI on a bike. In honor of the first day of Bike To Work Week, we bring you this montage of bike crashes, because nothing's funnier than watching someone else wipe out (and not get seriously hurt). Hope your week goes better than this. A public hearing on proposed impact fees will be held by Kootenai County next week. An advisory committee recommended the fees on future growth to the County to help fund area fire and highway district projects and county services. The fees range from as low as $305 to over $3000 and not everyone is happy about them, saying they put the burden on new construction rather than existing homeowners and businesses. Here's the details from the Coeur d'Alene Press. What's your thoughts on the subject? Construction starts this week on westbound lanes of I90 between Coeur d'Alene and Spokane. Here's the info from the Spokesman's 'Getting There' column. Scroll down, it's the 'segment' of the article. For the first three months of 2008, highway travel has declined by 2.3% nationwide and 5.6% in Idaho, relative to the same three months in 2007. That's according to a 'Traffic Volume Trends' report put out by the Federal Highway Administration. Travel on all roads and streets dropped by 4.3% for March '08 compared to March of the previous year. Travel for the month is an estimated 246 billion miles. In Washington, people drove 781 million vehicle miles in March. Across the border in Idaho, it was 418 million. That's a drop of 6.2% in Washington and 6.3% in Idaho. The report doesn't address why the drop in driving but I know I've been riding the bus much more frequently due to gas prices. I found this information from the CDA Chamber's website interesting. It's the distance from Coeur d'Alene to the following places, so if you're taking mom for a drive this weekend, you'll know just where you can get to on a tank of gas. Gas Tax Holiday: Good or Bad Idea? - The federal gas tax is 18.4 cents a gallon. Clinton and McCain would like to suspend that tax for the summer months. That money funds the federal Highway Trust Fund (HTF), which finances road projects nationwide. The HTF already faces a $3.4 billion shortfall, which is why our roads are in bad shape and we hear constant complaining about them. - The federal transportation department says every $1 billion in highway spending creates 34,779 jobs, which means the a gas tax holiday could cost 300,000 construction jobs. - Economists say the average driver will only save about $30 over the summer, or 33 cents a day, because oil companies will most likely push up the price of gas by almost the size of the tax cut if there is a gas tax holiday. - Eliminating the tax will lead to increased consumption. So that's my reasoning. Anyone have anything to add or a differing opinion? If you've got a few spare minutes today, whether you have teen drivers or not, take a trip over to the Idaho Transportation Department's XTR4 Teen Drivers website. It's fun and educational, whether you're trying to find out how to get a permit, drive under extreme conditions, or trying the driving simulator. My favorite part was the virtual driving test, although I apparently can't drive even as well as a teenager. I kept clipping the car in front of me during the parallel parking segment, then got a case of the giggles and backed into the car behind me. Oh well, I guess I should just be thankful it's not a case of art imitating life. Jaywalking: To Ticket or Not To Ticket? Do you jaywalk? Do you believe that if you get caught jaywalking you should get a $56 ticket? That's what the Spokesman's 'Huckleberries' blog is asking readers today, in response to an article by Doug Clark that says he believes emphasis patrols to bust jaywalkers shouldn't be a priority. Here's your chance to voice your opinion. Is jaywalking really the scourge of downtown transportation modes or simply a harmless way to get where you're going faster? Who Needs To Fly When You Can Ride Your Bike? Because May is National Bike To Work Month and a mechanical breakdown can happen to anyone, we offer this 'Bicycle Repairman' piece from Monty Python's Flying Circus. And if you can't comprehend it in English, it's even got Spanish subtitles! Expect some delays on I90 if you cross the border, lane repaving is getting underway. Here's the wrapup of area transportation projects for this week from the Spokesman's 'Getting There' column.